President Donald Trump has a vision for the federal government’s budget in 2018, and — among other nicks and cuts to NASA’s projects — it does not include any money for the agency’s equal-parts-bold-and-weird Asteroid Redirect Mission (ARM). And if we have no ARM, the future of prospectors flying through space and digging into various rocks around the solar system for valuable resources becomes much murkier. The Republican-led Congress has repeatedly expressed concerns about the mission’s viability and goals, going as far as to use last week’s authorization bill to basically tell NASA that ARM made no sense, and should be scrapped. Trump’s new proposal, if enacted, would simply take those sentiments to an explicit, mandatory level. 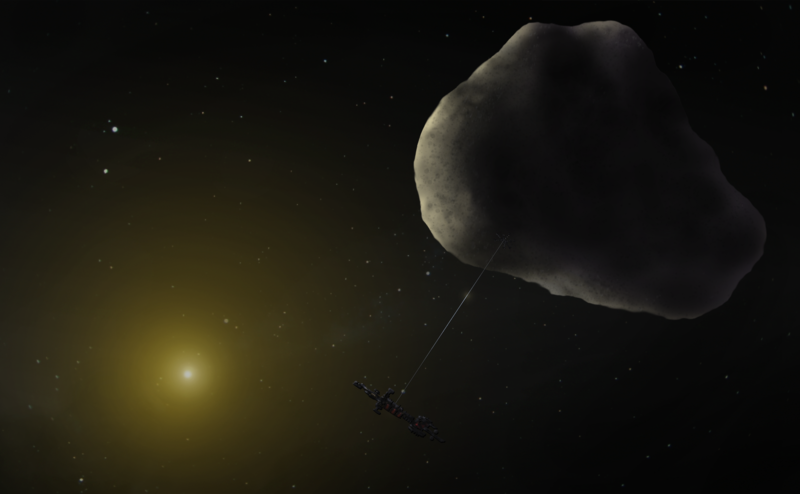 For the uninitiated, here’s why ARM has such strong detractors: NASA’s proposing a mission that sends a robotic spacecraft out to a near-Earth asteroid. It will land on it, pick up a boulder off the surface, retreat back into space and fly toward the moon, and drop the boulder into lunar orbit. After that, a future crewed Orion mission would rendezvous with the boulder and study it. Test out solar-electric propulsion technology as a more sustainable method of deep space travel. Demonstrate and evaluate precursor robotic technology capable of landing on asteroids for future asteroid missions possible — particularly the ones where we start to mine asteroids for resources. Understanding the structure and composition of asteroids better so we can plan better interventions in instances where they may pose a threat to the planet and its inhabitants. In its authorization bill, Congress argued NASA could find other missions with which to test out solar electric propulsion, such as an uncrewed Orion mission to the moon or next decade’s flyby of Europa. But what about the other two orphaned objectives? What missions can adopt them as part of their investigative goals? Unfortunately, the answer to that is unclear. There are no other plans so far for a future mission that will land on an asteroid. OSIRIS-REx, which is already en route to the asteroid Bennu, will be tasked with studying the structure and composition of a space rock in depth, and will collect a sample to send to Earth for laboratory analysis. What we learn will undoubtedly help us better understand what asteroids are made of and how we might go about changing their trajectories if they are on a one-way collision course with Earth. That sample won’t be acquired through a real landing, however — it’s something of a soft pogo bounce. And while we’re certainly bound to get a slew of data about asteroids, succeeding in picking up a boulder off an asteroid wouldn’t simply be a monumentally cool feat — it would be proof positive that getting valuable resources off an asteroid and bringing them to a place where we can readily harvest them is totally possible. It’s that last part that makes ARM such a bold mission. Success would essentially mean asteroid mining is not a far-off concept. NASA has designed ARM with a specific asteroid in mind, and with a specific timeframe in mind in order to rendezvous with the rock in a timely manner. If ARM is completely scrapped, it means we’re back to square one for designing any mission that is remotely similar. That means finding new candidate asteroids, figuring out when they’ll be making their way closest to Earth and planning a mission around that. It’s an insane amount of work, and few parties or institutions are in a better position to pull it off successfully than NASA. Not moving forward with ARM means the tangible reality of asteroid mining gets pushed back by 10, maybe 20 years. Hopefully, that kind of positive outlook will be enough to keep the development of asteroid mining systems moving forward as quickly as possible.